The fact is, your intimate skin is delicate and sensitive and not all wipes are made with your intimate skin in mind. All Vagisil Wipes are especially designed for the unique needs of intimate skin, gynaecologist tested and gentle enough for daily use. And did you know that intimate itch can be caused by many things such as perspiration, your period, some detergents and intimacy? 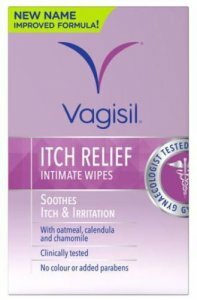 Only Vagisil Itch Relief Wipes give fast comforting relief from itch while also creating a protective barrier to help prevent further itch and irritation. Wipe external vaginal area from front to back. Use each wipe only once. Do not use if you have a known sensitivity to any of the ingredients. Aqua, Polysorbate 20, Laureth-9, Glycerin, Colloidal Oatmeal, Allantoin, Anthemis Nobilis (Chamomile) Flower Extract, Melaleuca Alternifolia (Tea Tree) Leaf Oil, Sodium Lactate, Phenoxyethanol, Benzoic Acid, Disodium EDTA, Dehydroacetic Acid, Sodium Hydroxide, Propylene Glycol, Parfum RD-005055.